An Islamic cleric, Jamiu Olasheu in the company of three others have been apprehended by the Police in Ogun, for allegedly being in possession of human skull. According to reports, the 35 year old cleric allegedly purchased the human skull for the sum of N250, 000. 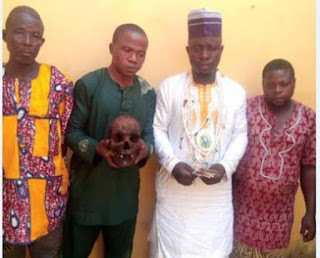 He (the cleric) who was later identified as fake Islamic cleric, had allegedly commissioned the duo of 45 years old Teslim Ayeniromo and Sunday Kolade (35) to get the human skull for him from a 51-year old Micheal Osanyinbi who lived in Agbara axis of Ado-Odo/Ota local government area of the state. Police Public Relations Officer (PPRO), Ogun State, Abimbola Oyeyemi, who confirmed the story to newsmen in Abeokuta, said the Police Patrol team from Agbara Division who were on routine crime prevention patrol of the area however, accosted the two men at Kofedoti area of Agbara with the human skull kept in a sack while on a motorcycle for onward delivery to the Cleric man. “The duo were promptly arrested and taken to Agbara Divisional headquarters where the DPO, CSP Adegbite Omotayo personally interrogated them. “On interrogation, they claimed that the human skull was given to them by one Michael Osanyinbi (51years) for onward delivery to the Islamic cleric. “They led the DPO to the house of the man who gave them the skull who in turn led the police to the self -acclaimed cleric. “The cleric has made confessional statement that he actually requested for the skull which Michael Osanyinbi promised to get for him at the rate of N25, 000 and N1, 000 for the bike man who will deliver it to him. Oyeyemi further stated that the state’s Commissioner of Police, Ahmed Iliaysu has ordered the immediate transfer of the suspect to Special Anti -Robbery Squad for further investigation and prosecution.